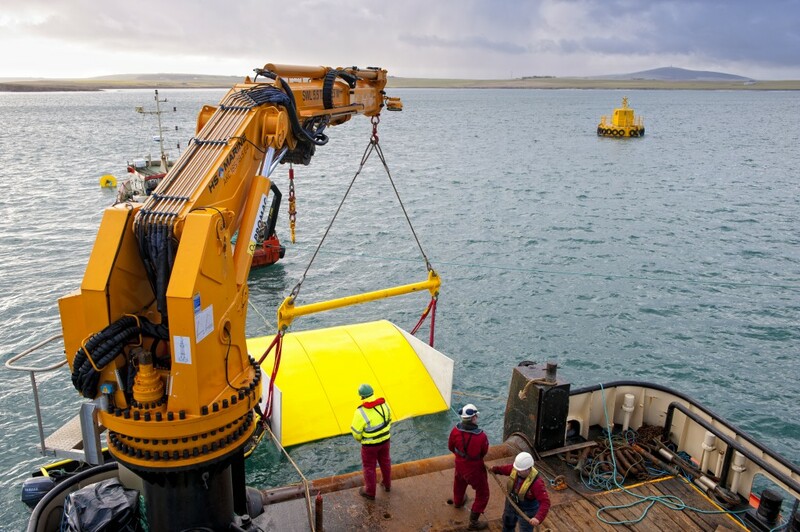 We are delighted that Nautricity have successfully deployed their CoRMaT tidal turbine at EMEC’s Shapinsay Sound site. The 10m diameter contra-rotating turbine was installed at the site for the first time earlier this week. The company also reinstalled their HydroBuoy mooring system which was previously tested, analysed and optimised at EMEC’s site in February 2013. The Hydro-buoy system is a platform technology utilising a combination of displacement buoyancy with hydro-dynamic lift, generated within the tidal flow, to provide the required tension on the mooring line in order to keep station. We are confident that Nautricity will learn a great deal from mechanical testing now the complete system has been installed, and will find the experience of operating in real sea conditions invaluable to progressing to the next stage of their WATERS2 (Scottish Government) funded project. Congratulations to the Nautricity team from all at EMEC.